Lagrange County, Indiana, which lies directly east of Elkhart County, on the Michigan border, is an integral part of the Elkhart-Lagrange County Mennonite and Amish settlement. The first to arrive here were a group of Amish families from Somerset County, Pennsylvania, and Holmes County, Ohio, who settled first in Clinton Township, Elkhart County in 1841, a portion of this group moving 15 miles (25 km) further east to Newberry Township, Lagrange County. 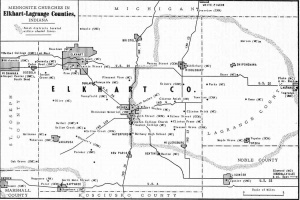 The descendants of this group divided about 1860 into the Old Order Amish and the more progressive element which later became a part of the Indiana-Michigan Mennonite Conference, largely in the Forks congregation, whose meetinghouse lies just east of the Elkhart County boundary. A second group of Amish, progressive from the beginning, came from Fairfield County, Ohio, to organize the Maple Grove Mennonite Church at Topeka about 1855. This group suffered two divisions, one before 1900, and one in 1923, which resulted in the Topeka Mennonite Church. The Townline Conservative Mennonite Church was formed out of former Old Order Amish about 1885, with its meetinghouse just across the eastern border of Elkhart County. Mennonite settlers from Somerset County, Pennsylvania, near Johnstown, were the majority element in the settlement made about 1860, which led to the formation of the Shore Mennonite Church (1874) near Shipshewana, later the Emma Mennonite Church (1901), the Marion Mennonite Church (1947), and the Plato Mennonite Church (1950). All these churches are west of the city of Lagrange, except the latter which is five miles (eight km) east of Lagrange. In 1954 there were the following congregations in Lagrange County: Old Order Amish, 17 congregations with ca. 1,000 members; six Mennonite (Mennonite Church) congregations with 1,132; one Conservative Mennonite with 120; and one General Conference Mennonite with 235. The total Mennonite and Amish baptized membership in Lagrange County in 1954 was thus ca. 2,500 in 25 congregations. Bender, Harold S. "Lagrange County (Indiana, USA)." Global Anabaptist Mennonite Encyclopedia Online. 1957. Web. 22 Apr 2019. http://gameo.org/index.php?title=Lagrange_County_(Indiana,_USA)&oldid=113833. Bender, Harold S. (1957). Lagrange County (Indiana, USA). Global Anabaptist Mennonite Encyclopedia Online. 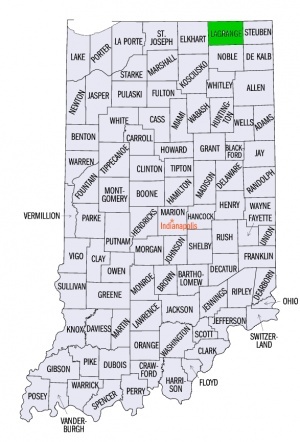 Retrieved 22 April 2019, from http://gameo.org/index.php?title=Lagrange_County_(Indiana,_USA)&oldid=113833. Adapted by permission of Herald Press, Harrisonburg, Virginia, from Mennonite Encyclopedia, Vol. 3, p. 268. All rights reserved. This page was last modified on 20 February 2014, at 06:31.